CO2 Solubility in Beer: Does Quantifying it Precisely Matter? My recent posts have prompted a couple of interesting questions about the solubility of dissolved CO2 in beer, tea and soda, so that’s what we’ll focus on today, keeping in mind that the points we cover can be applied to the solubility of O2 or N2 as well. First, let’s define exactly what we mean by solubility. To understand solubility, we need to understand another term: partial pressure. The partial pressure of a gas is the percentage of gas present in any particular environment, relative to any other gasses in that environment. The things that affect this are the liquid temperature, the liquid type, and the type of gas. For example, CO2 is exceptionally soluble in water, O2 less so, and N2 even less so. 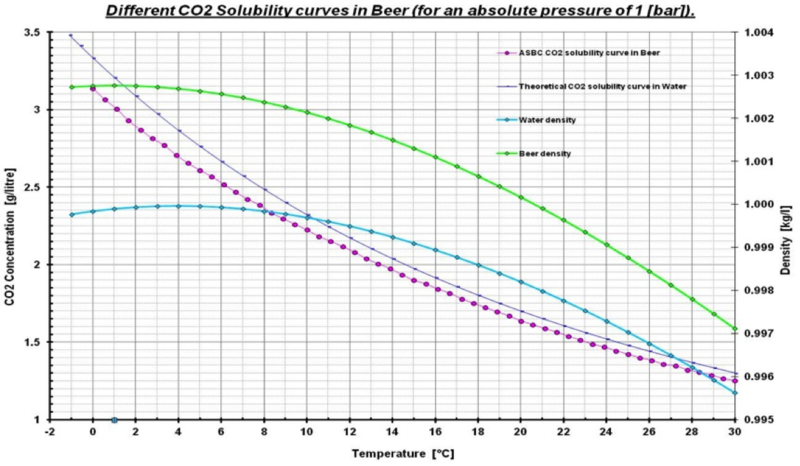 And the gravity (density) of a liquid will also have a big impact, as we can see by examining the graph below showing the solubility curves of dissolved CO2 in water versus a low-gravity beer. This graph also shows our third parameter, temperature. The higher the gravity, the lower the solubility. Likewise, a higher temperature correlates with lower solubility. Now let’s look at our questions. One customer wanted to validate multiple CO2 analyzers with a single dissolved CO2 liquid source, but was concerned that if he used water as the test liquid it wouldn’t relate back to beer. He also wondered if his analyzers should be calibrated individually (customized calibration) for the different gravities of different beers. And then I had a soft drink customer who was wondering about using data regarding the solubility of CO2 in beer, and whether or not it could translate to measuring CO2 in their soft drink products. These questions may seem very different, but my answer to all of them was the same. The main point we needed to know was whether or not the absolute concentration of CO2 – as opposed to partial pressure — in whatever liquid we were measuring was important. Both customers were measuring pressure and temperature to calculate their CO2 concentration. Both customers were happy with their products, but were concerned that not knowing the absolute concentration might matter to the quality of the product. I don’t think that it is necessary to know the absolute concentration of the CO2. In fact, I fear that if you knew the absolute concentration for every beer type and tried to monitor based on that, it could leave the potential for too many mistakes and could ultimately be more harmful than helpful. That’s because consistency in measurement technique is more important than absolutely quantifying the amount of CO2 in the liquid. Regardless of the type of sample, be it carbonated water, low-gravity lager, or high-gravity ale, most CO2 monitors will give you a concentration based on one solubility at equal partial pressures of the product. While it may not be the quantitatively correct concentration, it does represent a consistent percentage of the CO2 in the sample. If your high-gravity beer appears to need more CO2 to get the same sensory effect as your low-gravity beer, it may be because you need a higher pressure of CO2 to get the same carbonation level. My final thought is to keep it simple when measuring CO2 concentration. What you really need to trust is your sensory analysis and understand that if the measured CO2 value needsto be different on some products it may be because their gravity and other parameters are different.